The Republican tax bill that will become law is not a middle-class tax cut any more than it is a bill to open the Arctic National Wildlife Refuge or a bill to end the individual mandate on health insurance. It is a $1.5 trillion tax cut, with permanent cuts for business, temporary cuts for individuals—weighted toward the wealthiest Americans—and a grab bag of special interest provisions aimed at winning points with select groups. Most of the benefits go to corporations. It is not tax reform bill or a simplification of the law. It has alienated most of the country. The measure creates a host of new opportunities to game the system with pass-through income changes and other complicated technical matters that have not been analyzed or tested. Republican senators and representatives were desperate to get something passed so they could declare victory and go home. They still claim they know what they were doing and that not holding hearings or getting outside experts to review the details was the right process. Only time will tell how many unexpected tax dodges are buried in the bill, what will happen to the individual health insurance markets across the country, whether ANWR oil development will take place and how the country can afford to spend much more on the military and infrastructure while cutting taxes. The long-term consequences of the bill are likely to include a $1 trillion boost in the deficit, which will build pressure for Alaska's senators and other Republicans to claim that Social Security, Medicare, Medicaid and other programs have to be cut. They will try to sell those cuts as reform, which doesn't sound objectionable. About the temporary individual tax cuts, which are to expire in 2025, the Urban Brookings Tax Policy Center says taxpayers with income between about $49,000 and $86,000 would receive an average tax cut of about $900, or 1.6 percent of after-tax income next year. Taxpayers in the top 1 percent, with income more than $733,000, would receive an average cut of $51,000, or 3.4 percent of after-tax income, the center said. Ms. MURKOWSKI. Mr. President, I was proud to be a conferee for H.R. 1, the Tax Cut and Jobs Act, and I am pleased to join many of my colleagues in strong support of the conference report for it. I think, really, the title says it all. This bill will deliver tax cuts and new jobs for hard-working Americans. I think it will be good for our economy, it will be good for jobs and for growth, and it will be good for families and our businesses. As a starting point, we have tax reform-a huge and a complicated undertaking that really happens once in a generation around here. It has been 31 years since we have successfully reformed the tax code. I think we would all say it is long overdue. This bill reduces taxes in every income bracket, letting Americans keep more of their money. It doubles the standard deduction to put even more money back in the pockets of hard-working Americans. It doubles the child tax credit, which is so important, making more of it refundable to help parents and our families. It helps our small businesses. In the State of Alaska, about 99.6 percent of the businesses in Alaska are small businesses, and it allows owners to do even more by being able to deduct 20 percent of their business income from their taxes. It also cuts our corporate rate, currently one of the highest in the world. We all recognize this is a move that is long overdue and one that will make us more competitive, help bring jobs back to this country, and increase investments in America. I support tax reform, and I am also very proud to be the lead author of the second title, the energy title, in this bill, which I believe contains the single most important step that we can take to strengthen our long-term energy security and create new wealth-creating new wealth-rather than moving things around. This has been long fight for us. It has been a fight that has been going on for about 38 years, give or take. It has been a multigenerational fight for some of us. What we are doing is authorizing a program for responsible energy development in Alaska's nonwilderness 1002 area. This is an area Congress specifically set aside for its evaluation for its potential for oil and gas. 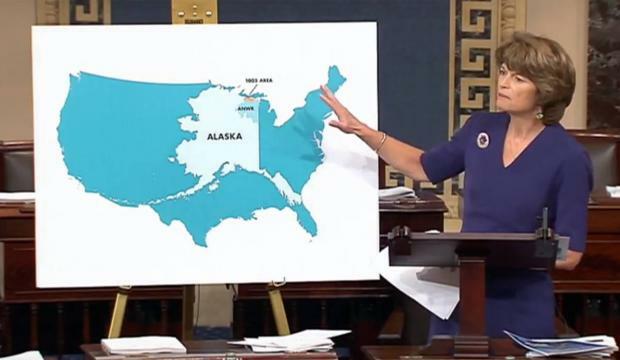 I have put a lot of charts about Alaska up, but here is Alaska laid over the United States of America, just to kind of put in context what we are talking about here with the 1002 area. The area of ANWR itself is an area of about 19.5 million acres. It is the combined size of Massachusetts, Rhode Island, Vermont, and New Hampshire, in this area, and in this portion of the State of Alaska. Contained within ANWR is additional wilderness acreage. There are about 7 million acres of wilderness contained in the ANWR area. I also want to remind colleagues who say we need to keep this 1002 area in a wilderness status-let me tell my colleagues, the 1002 was never in wilderness, is not in wilderness, and that is not what we are talking about here. We have 48 wilderness areas in the State of Alaska, with a total of about 56.6 million acres of designated wilderness in the State, but the 1002 is not wilderness. This is what we are talking about opening up for oil and gas exploration. This is an area-this small area up here-that contains an estimated 10.4 billion barrels of oil. We know we can produce it safely. We know we are going to need this oil in the years ahead. Now, some of my colleagues have suggested that somehow or other we don't need any more oil; that we are exporting oil now. Well, the reality is that world oil demand is rising; it is not falling. We need to bring more supply online, and we need to open up our most prospective areas. So, again, when we have a small area that has enormous potential, why would we continue to deny that opportunity? The International Energy Agency believes-and they stated it this year: "Global oil supply could struggle to keep pace with demand after 2020, risking a sharp increase in prices unless new projects are approved soon." So to suggest that somehow, just because we are exporting oil, we no longer need to produce it, just doesn't make sense. Exports are making our markets more efficient, but they don't mean we are suddenly more energy independent or permanently energy secure. Making sure we are doing more where we have high prospects makes sense. Our energy title also includes a bipartisan proposal from Sens. Cassidy, Strange, and King that will increase revenue sharing for the gulf coast for priorities like coastal restoration and hurricane protection. Overall, the bill-our title-is projected to raise nearly $1.1 billion over the next 10 years. Once production begins in the 1002 area, we will likely raise tens, if not hundreds, of billions of dollars for the federal treasury. Again, this is new wealth and new prosperity at a time when our nation needs both. Those are not the only benefits this energy title will bring. We are also talking about jobs-creating thousands of jobs-in Alaska and around the country; jobs that pay high wages, put food on the table, and put the kids through college. We are in a tough place right now in Alaska. We have the highest unemployment in the country. I appreciated the fact that my colleague from Washington talked about jobs and, in fact, noted that in the ties that bind the State of Alaska and the State of Washington, we do have a lot when it comes to sharing of jobs. I will remind my colleagues that when it comes to jobs, it is an estimated 12,000 Puget Sound jobs and $780 million in labor earnings that are connected with refining Alaska oil. So our jobs-our resource benefits not just us in Alaska but those around the country as well. What we are able to do by accessing this 1002 area also will help us keep energy affordable, effectively providing families and businesses with an energy tax cut. That, too, is important in context with this tax bill. We also protect national security by reducing foreign oil dependency, especially in West Coast states. Ironically, California and Washington State, as they see less oil coming from Alaska, as our throughput is declining, what is happening is that, in order to keep their refineries going and their jobs continuing, they are having to import oil. Where is California getting more of their oil from? From the Middle East. Tell me how that makes any sense. I appreciate that colleagues come to the floor with a passion about our State, but know that as Alaskans and as an Alaskan who is the author of this title, none of what we are doing in this effort to open the 1002 area will come at the expense of our environment or the local people. Some of the local people are here in Washington to watch the vote today. Hearing the voices of those who live there-there is a town, there is a village, there are people, there is a school, there is an airport in the 1002 area-a town, residents, community. This is not an area that is untouched, but it is an area we care about. We care about the people, we care about the land, and we care about the wildlife, but we know how to produce energy while protecting our environment. We have been doing it for decades, and we will continue to do it going into the future. Thanks to new technologies, the footprint of our development up north is smaller than ever before. The amount of land that development pads occupy now on our North Slope is now 80 percent smaller than in the 1970s when we first began operation in Prudhoe Bay-80 percent smaller. At the same time, the subsurface reach from those smaller pads is going to be more than 4,000 percent larger than where we were in the 1970s-more than 4,000 percent. What we are able to do is access more resources underground directionally in an area of 125 square miles. What the technology allows us to do is almost too hard for people to believe, and so they continue the same tired rhetoric we have heard for years. The fact is, we need less land to produce more energy than ever before. We are going to take care of our land. We are going to take care of the people who live on our North Slope. We are going to take care of the environment, and we will protect the wildlife on the Coastal Plain. The Central Arctic herd of caribou increased sevenfold in the years since we have been producing in Prudhoe Bay. That is the Alaskan way. That is what we do there. That is why we have written our language to be fully protective, and that is why we do not waive any environmental review process or consultation requirements with Alaskan Natives in any way. In fact, the only thing that we limit here in this bill is surface development. In this area of the 1002, in this 1.5 million acres, this provision, title II, says that 2,000 surface acres will be open-one ten-thousandth of all of ANWR. That is all we are seeking to do, and we will do it with care and concern for the environment. I have listened to colleagues say that we are destroying the refuge, that we will turn it into an industrialized wasteland. I am offended, I am horrified, and it is wrong. It is wrong for those from the outside looking in, who have taken a nice trip into an area and said: This must be protected. Your jobs don't matter. That resource that we rely on for jobs in my state doesn't matter; we will get it from somewhere else. Well, where are you going to get it from? Why not work with people who are going to care for the land, care for the people, care for the wildlife, do it with a level of commitment to a resource and to a cause that is strong and sound? For those who come in and say they know best and their idea is to just lock it up, that is not right. For 40 years, Alaskans have stood up and said: That is not right. We will continue in our effort to demonstrate to the rest of the country and the rest of the world how we are able to operate, how we are able to be responsible stewards of the environment, to produce jobs, to help Alaskan people, to help the country, and to help our allies. This is what we are asking for. As I close my comments, I recognize that tomorrow is coming up on the shortest day. We have had some very short days in Alaska. It is pretty dark there right now. I was home over the weekend. With the passage of this bill and the long-awaited opportunity to access our resources in the 1002 area for the benefit of Alaskans and for the benefit of our country, the days ahead look brighter for all of us. Mr. SULLIVAN. Mr. President, I would like to spend a few moments talking about why my colleagues and why the American people should be supportive of this very important legislation, historic legislation, that we are debating on the Senate floor. It is particularly historic for my State, the great State of Alaska. There has been a lot of misinformation on this bill, and we are seeing a robust debate, which is fine. I don't need to repeat all the arguments on both sides, but I will say that my colleagues on the other side have seemed to focus on one particular point. They are coming here and making this point again and again; that is, the point that this bill will supposedly raise taxes on the middle class. We are hearing it, and everyone is saying it. The problem with that argument is, it is fundamentally untrue. The truth will be in the paychecks of the American people, which they will see in a few months. Let me talk about some of the provisions that are in the bill. The bill will be a middle-class tax cut for the vast majority of Americans. Here are some of the provisions. These are in the bill. These are the facts. The bill doubles the standard deduction. For an individual, the standard deduction goes from $6,300 to $12,000. For married couples, it goes from $12,700 to $24,000. That is in the bill. That is important for middle-class families. It doubles the child tax credit. The child tax credit is doubled from the current $1,000 to $2,000, so more parents can claim it. It is in the bill. That is a fact. And it lowers rates. In fact, it not only lowers rates for middle-income Americans, it lowers rates on every single income bracket in the IRS code. That is a fact. Bottom line, an average family of four making $75,000 a year will have about 200 more dollars per month in take-home pay under this bill-$2,400 a year. A single parent making $41,000 a year will see their tax bill decrease by $1,300. That is a 73-percent decrease. That is a fact. It is in the bill. Let me mention one other critical way in which this tax bill will bring middle-class and working-class tax relief. It will get rid of the very regressive and unfair individual mandate of the Affordable Care Act. About 20,000 hard-working Alaskans and over 6 million Americans have to pay a tax, a penalty to the IRS for not buying something-health insurance-that they cannot afford. Let me repeat that. They are penalized for not buying something that they can't afford. Think about the absurdity of that. Here is why this is such an important middle-class tax cut. When we get rid of that penalty, close to 80 percent of the 6 million Americans who pay the Obamacare individual mandate tax-close to 80 percent of them-make $50,000 or less. Think about that. Tonight, we are getting rid of that tax, that unfair penalty, and that will undoubtedly bring tax relief for the middle class. This bill also decreases taxes on small businesses and companies so that they can reinvest at home in our great nation, hire American workers, give pay raises, and help grow our economy. Many of these ideas, doing these kinds of things, have been bipartisan policy ideas for years when we have talked about tax reform. Let me give you one. In 2012, President Obama said that our current business tax structure hurt American business and inhibited growth. He said that the tax system "provides tax breaks for moving jobs and profits overseas and hits companies that choose to stay in America with one of the highest tax rates in the world." That is from President Obama. It was true then, and it is true today. Something has to be done, and we are doing it tonight. The bill will also give small businesses and large companies a chance to help grow our economy. You have heard senator after senator come to the Senate floor. My colleague from South Carolina has talked about this eloquently for years. It is an issue I care deeply about. But here is the issue. We have had a lost decade of economic growth. For over 10 years, we have not hit 3 percent GDP growth once in a year. It is an issue I care deeply about. As a matter of fact, I come to the floor and I talk about it a lot. One thing I have noticed in my 3 short years in the Senate is that I am not sure I have seen my colleagues from the other side ever come here and talk about the need to rev up the economy or about the fact that one, one-and-a-half, two percent growth, which is what we have had for almost the last 13 years, is not good for the country. I think, unfortunately, a lot of them believe in this idea of the new normal-that America hitting at one, one-and-a-half, two percent GDP growth is America hitting on all cylinders. Don't believe it. We talk about GDP growth. What is that? It is really a proxy for the health of the U.S. economy. It is a proxy for the American dream. In the last 10 years, that economy has been sick. For millions of Americans, the American dream, which is based on a strong American economy, has been a mirage. We have to change this. This should be a bipartisan issue. Getting back to traditional levels of three percent or higher GDP growth should be something 100 Senators agree on. This bill is going to help us do that. Finally, I would like to talk about something in the tax bill that will greatly benefit my State and our country; that is, opening the 1002 section of the nonwilderness Arctic National Wildlife Refuge for American energy development. A lot of my colleagues on the other side of the aisle have talked about this, but I am going to tell you this. I can't begin to describe the elation that will be felt by many-so many-in my State when this passes. The vast majority of Alaskans support this provision and have supported it for decades. Hundreds, if not thousands, of Alaskans have worked tirelessly to get it passed since the 1002 area was set aside by this body in 1980 for possible energy development. Don't believe all the rhetoric about "Oh, that area is off-limits." That area is actually on-limits. In 1980, the Congress said: We know there is a lot of energy there, and we should look at the opportunity to explore it. Congress, come back and make the call someday. Hundreds, thousands of my constituents, my fellow Alaskans-and I know some are in the gallery right now, right above me-have been working on this for decades, and I want to thank all of them. But we have been stopped. We have been repeatedly stopped. You are seeing some of the arguments, many of which are truth-challenged. So I am being polite to all of my colleagues. Year after year, we have tried. The last time that we made a big effort in this, my colleagues on the other side of the aisle killed this provision in 2005. It was a crushing evening in 2005 when this provision did not pass. It was a crushing evening for the late, great Sen. Ted Stevens, particularly when then-Senate Minority Leader Harry Reid said that killing the ANWR provision and beating Ted Stevens was "one of the joys of my life." That is from the former Senate minority and majority leader. Voting for the provision to unlock ANWR tonight will be one of the joys of my life, and I am certain that Ted Stevens will be joyfully watching from above, smiling. Last month, a group of Alaskans came to DC to testify before Senator Murkowski's Energy and Natural Resources Committee about the importance to America, to Alaska, and to our communities of the energy provision in this bill. "My fellow Inupiat and I firmly believe that attempts to permanently block development in the 100-an area intentionally not designated as wilderness because of its oil and gas potential-is a slap in the face to our region and its people. It's exactly the same thing as saying "It's OK for everyone else in this country to have a thriving economy, but you can't have one at all. To you people living on the North Slope and you people living in Kaktovik: Sorry, you can't do it." Matthew went on to talk about how responsible oil and gas development supports local communities by providing jobs, business opportunities, and infrastructure investments, like schools and hospitals and clinics-things that most communities in America have in abundance. We don't have those in abundance in my great state. He said that the industry "has moved our people away from third-world living conditions-we refuse to go backward in time. It has provided other basic services most Americans may take for granted" that communities like his don't have. Increasing domestic energy production will not only be good for my state and for communities like Kaktovik, but it will also boost our country's economy, and-this is a very important point-it will strengthen America's national security. My colleague from Maryland, for whom I have a lot of respect, just talked about how this is going to hurt our national security. I couldn't disagree with him more. Producing more energy responsibly-oil, natural gas, renewables-and making the United States the world's energy superpower once again will dramatically increase our nation's national security. This is something that we should all agree on. I have served in the Marines for over two decades, and I have served as a U.S. Assistant Secretary of State, whose portfolio included global energy issues. I have seen how energy can be used as a tool for good, productive diplomacy and for troublesome power grabs by our nation's foes. When we don''t have to import energy from countries that don't like us or when we have the opportunity to actually export energy-American energy-to our allies, this dramatically strengthens our nation's national security. The presiding officer and I both sit on the Armed Services Committee. We have heard for years from the Department of Defense's military and civilian leaders. Whether he be Secretary Carter, a Democrat, or Secretary Mattis, a great Marine general, they have all consistently emphasized this point: Making America the world's energy superpower will help with jobs, will help with our economy, and it will dramatically help our nation's national security. Let me conclude by telling a story that really emphasizes this point. Last year, I attended the Halifax International Security Forum. National security leaders throughout the world attended. I was in a meeting with a great national security leader of this body, Sen. John McCain, and we were meeting with a senior-level Russian dissident. We asked him at the end of the meeting: What more can we do in our country to help push back against the Putin regime and the activities that it is undertaking to undermine U.S. interests around the world and in our own country? What more can we do? He looked at us and said: "The No. 1 thing that you can do is to produce more American energy." Let me repeat that. In terms of national security, the No. 1 thing that we can do is to produce more American energy. We do it more responsibly and with the highest environmental standards of any place in the world. Opening the 1002 area in using those high standards-the world's highest standards-with the most advanced technology, will produce more American energy for the betterment of my state, my constituents, and for the whole country. We are on the cusp of passing a bill that will put more money in the hands of the middle class, grow our economy, and fulfill a 40-year-long dream for Alaska. The might of America has always been and will always be in the ingenuity of our people-the ability of Americans to make decisions for themselves, to live their lives as they see fit, to build, to grow, and to make a better tomorrow for the next generation. The American dream does not have a price tag, but it can be stymied. It can be stymied and stunted by an overbearing Federal Government that wants to hinder the freedom of the individual and an overbearing Federal Government that crushes economic hope and opportunity through overtaxation or overregulation. It does this by telling someone like Matthew Rexford, who is from a small village more than 5,000 miles from here, that he and his people cannot make better lives for themselves and for their children by developing resources on their own land. That is going to end tonight. At long last, that is going to change, and the vast majority of Alaskans-Democrats and Republicans, Native and non-Native-are going to celebrate. I believe, when the American people realize and experience the positive benefits of this bill through stronger economic growth, better jobs, and more take-home pay, that they are going to celebrate too. I urge my colleagues to vote for this historic legislation.